kCura today announced they ranked 31st on Deloitte’s Technology Fast 500, a ranking of the 500 fastest-growing technology, media, telecommunications, life sciences, and clean technology companies in North America. kCura is also the 7th-highest ranked software company on the list and the highest-ranked Chicago-based company. 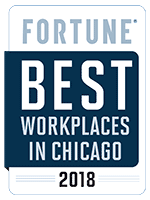 The company grew 5,775 percent from 2007 to 2011.
kCura was recently named one of Chicago’s 101 Best and Brightest Companies to Work For in 2013 by the National Association For Business Resources for the third consecutive year. KMWorld includes kCura in their annual list of 100 Companies That Matter in Knowledge Management. kCura’s founder and CEO, Andrew Sieja, was recently named a winner of the Ernst & Young Entrepreneur of The Year award for 2013 in the Midwest region. The award recognizes entrepreneurs of high-growth companies who demonstrate excellence in innovation, financial performance, and commitment to their businesses and communities. Attendees at LTNY 2013 will have the opportunity to get hands-on with enhancements in Relativity 7.5, and see the latest Relativity Ecosystem applications at the annual legal technology conference. kCura, developers of the e-discovery software, Relativity, today announced the launch of Relativity 8. This latest version of the platform adds key feature improvements—including email threading; faster search speeds; easier calculation of precision, recall, and F1 in Relativity Assisted Review; and the ability to process EnCase Logical Evidence Files. D4, LLC, a Relativity Premium Hosting Partner, today announced that they have earned Orange-level Relativity Best in Service status for their commitment to providing an exceptional Relativity experience for their users. International law firm, Holland & Knight, chooses Relativity to meet the unique needs of their diverse clients. kCura were recently positioned in the 'Leaders' quadrant of the Gartner 2013 Magic Quadrant for E-Discovery Software report. Gartner's report represents an analysis of 23 e-discovery software providers, and all providers were evaluated based on their completeness of vision and ability to execute. LitSavant, a UK-based provider of e-discovery consultancy and litigation support services, today announced their release of the LitSavant Conformity Engine. The Relativity application enables users without programming knowledge to efficiently design and implement conditional rules that help guide workflows in Relativity. Conformity Engine is now available in the Relativity Ecosystem. kCura, the developers of Relativity—web-based software for the processing, review, analysis, and production of electronic evidence during litigation and investigations—was recently selected as a finalist for a 2013 Illinois Technology Association (ITA) CityLIGHTS award for the third consecutive year. This year, kCura is a finalist for the Lighthouse award, which recognizes companies who, through innovation in products, services, or business approach, have grown to become a serious competitor in their respective marketplace. RenewData, a Relativity Premium Hosting Partner, today announced that they have earned Orange-level Relativity Best in Service status for their commitment to providing a high-quality Relativity experience to their users. kCura was recently recognized as one of the “100 Companies That Matter in Knowledge Management” by KMWorld magazine for the second consecutive year. The complete list of this year’s 100 companies is available here. kCura, developers of the e-discovery software Relativity, today announced that Bricker & Eckler LLP has purchased a license to install Relativity firm-wide.